Currently in its third generation, the Lexus RX 350 has long been one of the better looking mid-size SUVs on the market and represents the only true crossover in the luxury line. The introduction of the F-Sport variant at the 2012 Geneva Motor Show foreshadowed the global release of the higher performance model last July. The 2013 Lexus RX 350 F-Sport continues a proud tradition of luxurious comfort and unabashed performance. The appearance of the RX 350 is distinguished by the chrome accents outlining the trademark spindle grille and defining the headlamps, framing the side windows and marking the bottom of the door line on both sides. The chrome accents continue in the graceful lines of the premium roof rails. Scooped fog lamps, smooth sides with subtly raised wheel surrounds and a rear liftgate bearing chrome tail lamp surrounds with a chrome handle bar between them dissect the cleanly sculpted rear of the crossover. The whole of the vehicle driven was covered in an elegant high-gloss obsidian finish. The racked windshield directs air over the top where an integral spoiler prevents inclement weather from obscuring the rear view, aided by a wiper anchored at the top instead of the bottom of the liftgate window. This achieves much better clearance of the required vision area than a bottom mounted wiper arm. The dark graphite finish of the 18-inch aluminum alloy wheels completes the crossover’s aesthetically pleasing outer appearance. Inside the 2013 Lexus RX 350 F-Sport shares the open, roomy and well planned interior of its sister models, but is distinguished by the aluminum sport pedals, F-Sport three-spoke highly-articulated steering wheel with paddle shifters, plus genuine wood accents and heated/cooled perforated leather seats. The center console creates a comfortable and adjustable armrest while the mouse-like data input controller is right at hand. The display screen is very wide, allowing a full navigation screen plus a square for climate, entertainment or other information as well. Overhead a power moonroof provides access to the open air, for those lazy evenings in summer when a light rain has made the atmosphere clean and inviting. Numerous handy storage niches include one obscured beneath the center console – for those little things you want out of the direct line of sight and yet readily accessible. The roomy rear seats, following the latest trend, split 40/20/40 and feature a center armrest with storage space for rear seat passengers. The 2013 Lexus RX 350 F-Sport features a heads-up display of your digital speed and gear position in white letters over the hood. This eventually becomes part of peripheral vision, hardly noticed unless rapidly changing. It is easily legible except when the illumination before the car is unusually midday full-sun bright – at night it is a clearly visible aid to heightened alertness. Blind spot monitoring is also a welcome safety aid, especially when changing lanes on busy freeway systems. Active head restraints compliment an advanced set of airbags to insure occupant safety. State of the art electronics, working in concert with the fulltime active torque control all-wheel-drive, assure sure-footed stability and traction in the most inclement weather, like what Denver experienced on February 24 and again March 9. Many other parts of the country are weathering extreme winter conditions, as well; creating conditions the RX 350 was born to securely transport people through in comfort and luxury. These systems are reinforced first by Xenon headlamps, fog lights and LED daytime running lights, plus rain-sensing, variable-speed, intermittent wipers. Secondly, the 2013 Lexus RX 350 backs those systems up with its connectivity, instigating automatic collision notification via Safety Connect or via an Emergency Assistance Button. One more level of preparedness comes with tire pressure monitoring, on the outside chance a modern tire should experience any significant depressurization. Add to that the tool and first aid kits that come standard in the RX 350. Should the F-Sport be stolen, you can rely on the theft deterrent system to locate the vehicle and immobilize the engine. On February 24, the Lexus had a snowdrift on the hood from the upper half of the windshield to the front edge of the hood, at least 15-inches thick measured diagonally at its deepest point. Reluctantly, the vehicle was cleared of snow and taken out to measure its prowess in navigating cold and very wet streets mixed with bits of snow. In some cars coping with wet, slick streets, the 270 horsepower of the 3.5-liter four cam, 24-valve V6 could be a problem, but the superiority of the active all-wheel-drive made traction and acceleration child’s play for the RX 350. It had no problem with the nasty weather even when it came to braking, thanks to power assisted disk brakes on all four wheels. The warmly heated seats kept us comfy inside and saved gas, as we needed less assistance from the climate control once the seats warmed. 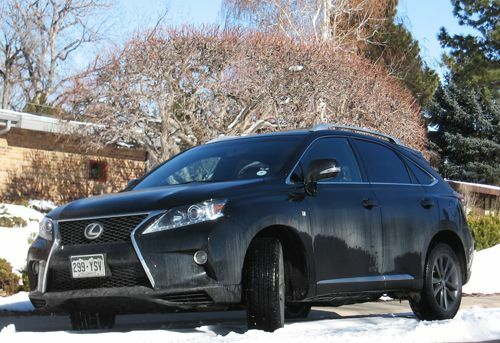 Once the weather cleared, we took the 2013 Lexus RX 350 F-Sport on an extensive drive through the high plains east and north of Denver, racking up some 200 miles without any sign of fatigue. On the highway it is an interstate travelers dream – comfortable seats, responsive easy-to-use cruise control, marvelous phone connectivity and achieving a manageable 23-mpg in intermittent highway driving. In warmer weather, the moonroof was tilted to let in the outside air, refreshed by the advent of spring. The fresh air served to enhance our enjoyment of the exquisite audio reproduction provided by the Mark Levinson 15-speaker surround sound system, pounding out tracks from my iPhone via Bluetooth audio. The 2013 Lexus RX 350 F-Sport is not meant to paint the streets greener, but rather to plow through the roads encountered with power and posh comfort to spare. It rates only 5 out of 10 on emissions for both CO2 and particulates, but there are worse offenders, along with many that do better. Be that as it may, the RX 350 is the most popular mid-size crossover in the emissions-conscious land of California, according to a report published by the California Auto Dealers Association. The F-Sport fares better with crash tests, rating five stars overall and for side impacts and four stars for frontal collisions and rollovers. The Lexus RX 350 F-Sport has a base price of $47,000 and certain features mentioned were optional, upping the price of the model driven some $5K. The final price for this model was $52,970, which included a destination charge of $895. The RX 350 has always been a personal favorite, simply because of its luxurious appointments, attractive appearance and ideal size – to our thinking. Some SUVs are too big and some are too small, but for our money, the 2013 Lexus RX 350 is just right, and the F-Sport option is there for those who need or simply desire a little extra power. If the information on hand is correct, the RX 350 is among the many renews slated for the Lexus, Toyota and Scion lines over the next year, meaning as the new generation nears, there will be deals to be had on the 2013 model. No matter what the next generation brings, most anyone would be proud to own one of these marvelous vehicles for many years to come.